Grief is an unpredictable thing, and honestly, I don't think it ever really goes away. I think we just learn to manage it. Characters: 4.3/5 --They all give off this truly haunted vibe, that makes you very curious as to how they may have gotten that way. Flow: 3/5 -This could use some better editing…way better editing. Backdrop (World Building): 5/5 –A Funeral home, on top of a mountain in Oregon, right next to the Ocean…creepy but beautiful. Ending: 3.7/5 Cliffhanger: YESYESYES I wonder if the voices told her DoItDoItDoIt? Will I continue the series? Immediately started Verum. It's hard for me to write this and not be influenced by my opinion of the second book Verum while doing so. 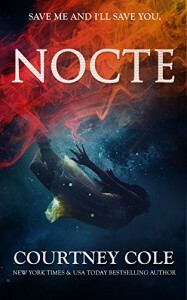 But, here goes…Nocte had hooked from the beginning, I was so hooked, I couldn't wait to find out what the secret was…and then…I found out what the secret was…I was sort of numb, thinking wow, seriously, that's sort of genius. Except for the part at the very end where you find out there are more…secrets…and this continues on my review of Verum.